Russian interests should be considered in the association agreement between the European Union and Ukraine, said Spanish Foreign Minister Jose Garcia-Margallo, adding that the essential strategic partnership between Russia and the EU should be restored. “I think that we need to somehow include Russia’s interests into the association agreement between Ukraine and the European Union, this agreement needs to be complemented by cooperation with Russia,” the Spanish minister said after meeting with Russian FM Sergei Lavrov in Moscow on Tuesday. The association agreement ratified by both Ukraine and the EU in mid-September of 2014 lies at the heart of the Ukraine’s year of turmoil. People in Kiev started to flood Kiev’s Maidan Square soon after then-President Yanukovich chose to put off a final decision on economic integration with the EU, saying he needed time to weigh possible gains and losses. Russia had been warning Ukraine would lose a preferential trading position in its $2.5 trillion market if it integrated closer with the EU. President Putin said in June 2014 Ukraine will lose duty-free imports should it sign the agreement, as such a move would result in a flood of European goods into the Russian market via Ukraine, which could threaten Russia’s economy. The association agreement between Ukraine and the EU envisages a gradual deepening of economic and political ties. The economic part of the agreement including a free trade zone was signed in June 2014 hoping to help integrate Ukraine into Europe’s $17 trillion economy. The process is expected to be completed by the end of 2015. 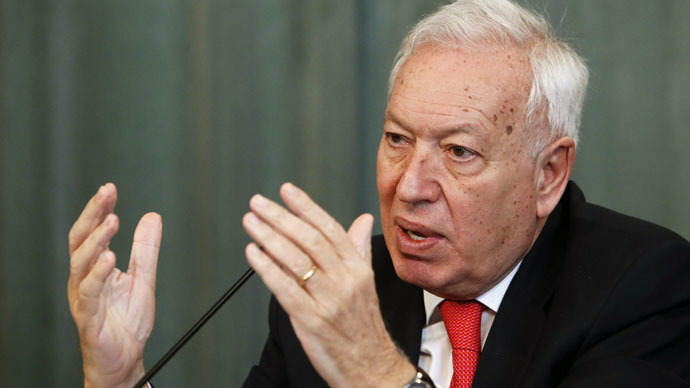 The relations between the European Union and Russia are obviously going through hard times and a broader format in which strategic cooperation can be restored, is necessary, Garcia-Margallo said. The foreign minister added that no one benefited from the introduction of sanctions and they brought great harm to the Spanish economy. The issue should be reviewed in accordance with how the Minsk agreements are being implemented, he said. In 2014, the EU lost €40 billion as a result of Russian retaliatory measures to the European sanctions. The union’s economy is likely to lose €10 billion more in 2015 if the tension continues, said Russian Prime Minister Dmitry Medvedev in December.